Thinking about getting your dog a new bed? 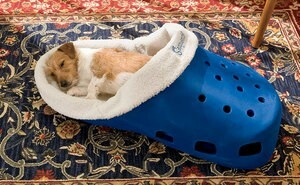 Tired of the same old dog beds you typically find in the stores? Try looking for a more luxurious dog bed — a dog bed that is out of the ordinary. A luxury dog bed will make a unique addition to your decor in your house. It will also be a conversation starter with anyone that comes into your house. Pet Murphy Bed – This bed is great for small spaces. When your dog is ready for bed just pull the bed down. In the morning, push the bed back up for storage. Sweet! Jakey BB Dog Bed – This bed will make your dog feel like he is royalty. The Jakey BB is handcrafted and custom made. Car Dog Bed – Perfect for the adventurous pet that’s always on the go (or a racing family). And how cute would this be if you happen to have kids who have car beds? Maybe you’re looking for something a little less expensive. Or, you might want to make a dog bed yourself. Good news: you can make no-sew dog pillows for very little money!